JMF Disco offers an experienced Wedding DJ in Hawkhurst to help with your special day. 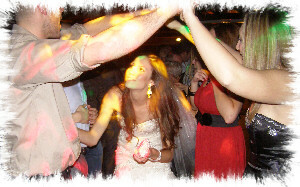 JMF Disco is owned and presented by DJ John Padmore, a reliable, experienced Wedding DJ in Hawkhurst. My aim is to provide you with all the help you need, from your initial phone call to seeing your happy guests leaving after a wonderful nights entertainment, at your perfect reception provided by your Wedding DJ Hawkhurst. Call or email JMF Disco for your Wedding DJ Hawkhurst to find out how I can help you. Have a look at the Weddings page for more details of the Wedding DJ Hawkhurst service I offer and call me to discuss how I can help make your evening very special. Contact Wedding DJ Hawkhurst on Tel 01795 429777, Mobile 07895 546183 or by email to discuss your Wedding DJ needs or questions. Saint Ronans offers a magnificent 19th centruy Jacobean mansion setting for your wedding with a 50ft ball room with polished oak parquet flooring and an ambiance to match. They offer variuos wedding packages to tailored to suit your needs. We also provide our wonderful wedding DJ and wedding disco hire services in the surrounding areas including Cranbrook, Benenden, Rolvenden, Newenden, Bodium, Sandhurst, Robertsbridge, Hurst Green, Ticehurst, Lamberhurst and throughout the Tunbridge Wells area. - I'm sure I can provide you with the wedding reception in Hawkhurst you really want!